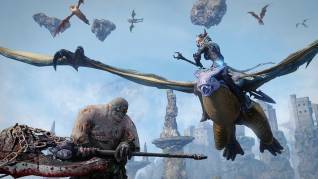 We got the chance to take a deeper look at the new MMORPG from Nexon America, Riders of Icarus, for a private press tour taking us around the game and showing off some of the coolest features in this soon to be released fantasy title. Already available for the Asian market Nexon are preparing for the North America release and so we, along with two other press outlets, got our own personal tour guides to take us around this epic fantasy world. Recently we already had the opportunity to play in the closed beta weekend and check out the game, so we already had a pretty firm knowledge of how the game worked and the importance of taming. The early portion of our tour went through taming in a little more detail and filled in some blanks we were unaware of or simply unable to test for ourselves during the beta. Heading into the woods we came across some roaming bears, a quick hover over them brought up a tooltip which told us what level the creature was, whether or not it was tameable, and how many “taming points” it would cost to try and tame it. Taming points increase as players level up (effectively stopping low level players taming high level creatures), and are used with each taming attempt (used up even if you fail), but can be replenished with a potion so we were told. The actual taming process is relatively simple, you use the taming button to go into your taming stance and then approach your chosen target and use the spacebar (jump) button to jump on their back. From here a mini-game type popup appears with four keystroke images bound to WASD that light up in a random order and we had to quickly push the correct button to try and dominate our creature target. The order that the images light up is random, as is if any light up at all, and so sometimes you will simply fail and be thrown off the mount, but if you are successful then you tame the creature and instantly have it as a mount (providing you have space as players can only tame and hold a certain number of mounts). We were also taken to another bear, this time an elite named bear that roamed around on its own and was a little tougher to tame, it had a special condition that we had to try and mount it by jumping off a high up ledge and landing on its back! It took us all a couple of attempts, but we were the first ones to be successful and got the mount (due to the longer respawn timer on elites we didn’t wait around for everyone else to get one). With the basics of taming mastered we headed back to the camp to see just what our creatures could do. To start with they are, obviously, mounts and you can ride around on them to travel quicker, you can fight on the back of them with mounted weapons as well as using their own unique skills that they unlock by levelling up (done through simply having the creature summoned). They can be turned into a summonable pet using a Pet Scroll (but they cannot be converted back into a mount), even equipped with items and armor to make them stronger, or their own animal aspects can be turned into a trinket buff to be applied to weapons or armor using a Power Seal scroll. With this it was explained that this gives players a reason to want to tame multiple versions of the same creature, especially rarer and elite mobs that are the best battle companions and offer the most powerful gear buffs when sealed. The use of tamed creatures explained we then jumped into combat, taking on a level 20 group instance at Carleon Estate, a ghostly mansion filled with all types of enemies and the final boss Carleon the Vampire. This particular boss demonstrated some different mechanics of boss battles including various AOE attacks, the ability to float in the air during combat, and changing into his final form as the battle progressed. The combat and dungeon played fairly similarly to most other MMORPGs, but was still well done. The next area was a lot more interesting; switching to some level 25 characters we appeared on top of a tower known as Fort Baelias out in the sea somewhere that was surrounded by dozens of islands floating in the air. To get to these islands we would need to fly, fortunately we had a handful of flying mounts in our inventory including a huge blue dragon that we quickly saddled up! A double spacebar had us leap into the air and start hovering, holding spacebar ascended us and we could fly around with WASD and aim ourselves using the mouse crosshair to get around. Here we were shown aerial combat, fighting other dragons and dragonriders in the sky, dashing in and launching attacks then flying out of the fray. It was fun, if not a little manic trying to keep track of your target, and played like normal combat with some verticality thrown in and so wasn’t too challenging. What was a little more challenging was the mid-flight taming we were then told to attempt, hovering over the top of one of the flying dragons we had to jump from the back of our own mounts and try to land on our target’s back or take a long drop down into the ocean (which thankfully didn’t kill us). We got the hang of it pretty quickly, unlike some of our companions, and managed to snag a few Screamer dragons. The final part of the tour, with flight now covered, took us high up in the sky to Attaius Peak, a huge lake nestled into a mountain and the home to the game’s first 10 man raid. Entering as a five man group we weren’t expecting great success, but it was definitely a worthwhile experience as we loaded into the area and were informed to destroy three stone pillars to summon Attaius. Whilst the loading screen for the raid was a dead giveaway of who Attaius was, it was no less impressive as the huge water giant appeared in the middle of the lake (so big we only saw him waist up). Attaius was targetable, as were each of his arms that did separate attacks; our group was guided towards all focusing on the arm shooting lightning around the screen and punching the living hell out of us and knocking us into the water. The fact that we had no chance against this Raid boss very quickly became a reality as even after many hit and run attempts we’d not even scratched him, but it was still very fun to see him in action! Overall the game is in a good spot, very classic in many elements when it comes to themepark style MMORPGs, complimented by some amazing graphics. 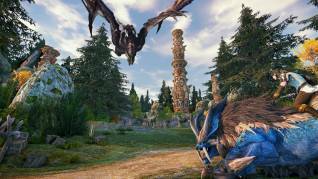 The taming element is deeply rooted throughout the game and has definitely been implemented well for exploration, combat and even crafting, but the “taming points” aspect has left us with some concerns depending on how the publishers finally monetize (which they’re still working on). The fact of the matter is that your taming points, without a potion, are finite and the more elite/rare the creature the more points they use, and they can use points when failing (which is very RNG based already). If potions become a bit more of a premium asset that players need to drop money on to participate in taming elites regularly (ie. who would go hunting the most elite dragons without a few potions to ensure they have enough points when they get there?) then it’s going to have a soft paywall that we think will restrict higher level creatures to paying players…. but we shall see. With this potential concern put to one side the game is otherwise a pretty fun and enjoyable title and worth keeping an eye on. 3 Comments - "Riders of Icarus Press Walkthrough"
You can use potions but health and mana also recover over time when out of combat!